One last note before the New Year begins. When I was asked a little less than a year ago what our ambition was for revenue in 2013, I grabbed a number out of the air. It was our combined editorial budget at the Beast in 2012, which was $900K. Maybe it was unreasonable to think we could make the same salaries independent as we did under a corporate umbrella; maybe I should have made the goal higher – because we also had to find staff and time and resources in 2013 to do all the administrative, business and technical work that the Beast had done for us; maybe I should have set the goal considerably higher if we were able to corrall enough resources to start commissioning and publishing more long-form pieces. But, hey, I didn’t know what to expect, and $900K seemed fair enough if I had to pick. That’s what you call a strong finish. We end the calendar year with gross subscription revenue of $851K. We have no debt. We have almost 34,000 subscribers. Almost 9,000 of them are now on auto-renew, and if our 25,000 original supporters renew next year in numbers comparable with the very beginning, then we’ll finally have a solid basis for a ongoing, entirely-online blogazine with no sponsored content and (so far) no advertizing. To coin a very 2012 phrase: you built that. And we’re incredibly grateful to live in it. Thank you. And a very Happy New Year from all of us – me, Patrick, Chris, Jessie, Matt, Alice, Chas, Brian, Brendan, Jonah and Tracy – to every single one of you. The statistics are bleak: only 8% of people who make New Year’s resolutions stick to them, and those who don’t usually abandon them after just one week. Unrealistic resolutions are fated to fail. And it is unrealistic to think that you can immediately overcome a habit you have spent years establishing. But is this necessarily harmful? There’s a good chance that it is. If your New Year’s resolution is to eat less, but you have no plan in place — or even if you do have a plan and you fail — you will do damage to your sense of self-worth. If you already have a complicated relationship with food, your likely coping mechanism for failure is eating more food. Thus the New Year’s resolution to eat less can actually result in your eating more. Ditto drinking, drug use, smoking, finding a mate, exercising, etc. Naturally, if you set more realistic goals, you are more likely to succeed. In a study that looked at the role of expectations in exercise, the psychologist Fiona Jones and her colleagues found that people with more modest expectations were far likelier to complete a twelve-week-long exercise course. And once we’ve set goals, we’re most likely to reach them by creating a firm plan. The theory of implementation intentions, a term coined by the psychologist Peter Gollwitzer, maintains that we have a better chance of sticking to a goal if we think about contingencies in advance and devise a direct, automatic response to each of them. (If feel too tired to go to the gym, I’ll have some coffee or eat an apple before heading out.) “It’s harder to break a specific commitment then a nonspecific one,” [psychologist Katherine] Milkman said. It’s easy to resolve to be more altruistic, to exercise greater self-control, to be more patient, or to enhance one’s life, but it’s costly to do these things. Suppose that you aren’t always as generous and kind as you would like to be, or that you have trouble resisting temptation, or that you don’t give yourself enough time off. If so, it’s probably because it’s costly to do those things, and it’s hard to anticipate those costs and burdens in advance. The best remedy is to find ways to reduce such costs and burdens. If you want to be more altruistic, you might set up automatic monthly gifts to your favorite charity. If you want to increase your self-control, you might alter your environment so that you run into temptations less often — for example, by keeping less food in your refrigerator. If you want to have an adventure or two, you might accompany your New Year’s resolution with a purchase, today or tomorrow, of a plane ticket. 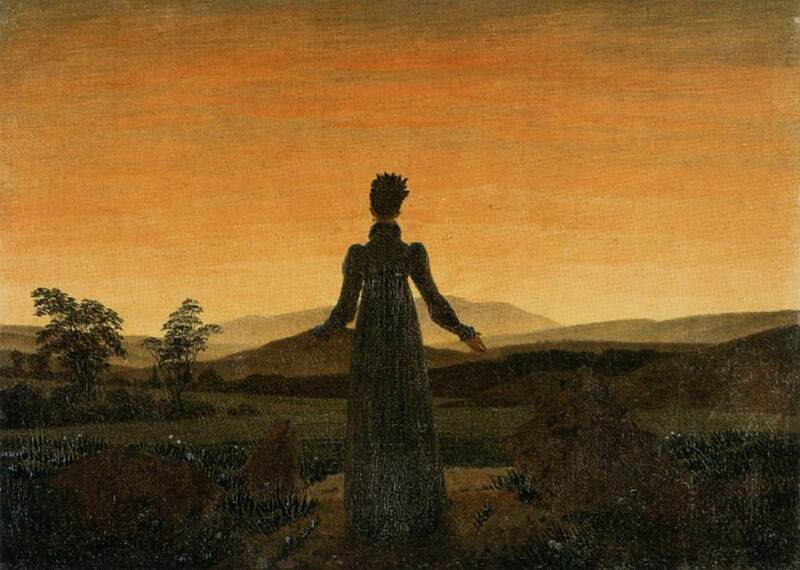 A woman in a long dark dress stands facing a sunrise that bursts up from behind a mountain. The rays of sun blaze and illuminate the rocky landscape, turning the sky a fiery orange. The woman is quite far from the sunrise but Friedrich positioned her in such a way that the rays seem to be shooting out of her whole body. And even so, she is not contorted in ecstasy before the new day. She’s not grasping at the sunrise either, trying to gather the sun into herself. She simply stands there, waiting, her arms turned slightly open. Interestingly, this painting is sometimes called “Woman before the Setting Sun.” Caspar David Friedrich … often mixed up time in his paintings. Now something is rising, now something is passing, now something is dying, now something reborn — nature and time always infinite, and mysterious, happenings to stand before in mute awe. Friedrich once said of his paintings (in other words, his life), “I shall leave it to time to show what will come of it: a brilliant butterfly or maggot.” This is exactly what the woman in “Woman before the Rising Sun (Woman before the Setting Sun)” is doing. She opens her hands a little bit toward to the coming sun and invites the new day to arrive. She welcomes her spring as the winter passes, leaving time to show what will come of it. Two boats set sail in those prewar years a century ago: the boat that sailed on and the boat that sank. Olympic or Titanic? Which is ours? It is, perhaps, essential to life to think that we know where we’re going when we set out—our politics and plans alike depend on the illusion that someone knows where we’re going. The cold-water truth that the past provides, though, may be that we can’t. To be a passenger in history is to be unsure until we get to port—or the lifeboats—and, looking back at the prow of our ship, discover the name, invisible to our deck-bound eyes, that it possessed all along. People take part in a traditional sea bathing to mark the year’s end on December 31, 2013 on a nudist beach in Le Cap d’Agde, southern France. By Pascal Guyot/AFP/Getty Images. At 12:00 a.m. MST this Wednesday, the first legal sales of marijuana will occur in Colorado. Other sales will follow shortly in Washington state. How will this actually work? Colorado has been scrambling to come up with a legal architecture for this new industry, and the results look more modest than many expected (e.g. : There will be a very limited number of distributors, it can only be used at home rather than in cafes or large parties, etc. ), but there are some creative entrepreneurs at work already. But what will this look like in a few months? Will marijuana lose some of its stigma? Will it lose some of its caché? Will usage actually increase substantially, or are the people who would use it already finding ways of getting it? And, perhaps most importantly, will Colorado’s and Washington’s experiences end up serving as an example or a warning to other states? If the movement will continue to succeed, it must be actively committed to making implementation work and work well. If the experience of the Affordable Care Act in 2013 has shown us anything, it is that implementation matters. Botched rollouts, unforeseen bumps in the road and other challenges hurt advocates and embolden opponents. If the price gets too steep, there is another option for those who planned ahead or have friends who did. Since last December, Coloradans have been allowed to grow up to six plants at home and share the produce, up to an ounce at a time, “without remuneration.” Those provisions could give rise to an alternative distribution system, although how far cannabis cooperatives can go without breaking the law is a matter of dispute. At what point does compensation for expenses become remuneration? “This is a difficult area of law that I anticipate will receive a lot more attention from state and local elected officials,” Elliott says. 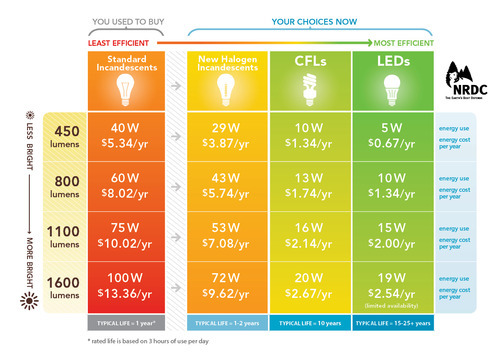 To be clear, incandescents are not disappearing at the first of the year — they’re just getting more efficient. And technological advances — like the GE 43W bulb below that replaces the 60-watt incandescent — have already saved homeowners and businesses billions of dollars on their energy bills. The new standards eventually will save as much electricity as is generated by 30 large coal-burning power plants – and the associated pollution that harms our health and contributes to climate change – every single year. In 2007, Congress tackled a pretty important energy bill, which included light-bulb provisions that weren’t considered controversial in the slightest. At the time, Rep. Fred Upton (R-Mich.) and congressional Democrats worked together on the larger legislative package, which included advanced light-bulb standards intended to spur innovation, lower costs, and improve energy efficiency. The provision was approved with bipartisan support – the radicalization of the Republican Party has intensified quickly in recent years – and the larger bill was easily passed and signed by President George W. Bush. What’s more, the policy has been quite successful, working exactly as intended, and producing the kind of energy innovation proponents hoped to see. It was, by any fair measure, a bipartisan success story. We’ll still occasionally hear Republicans describe the Bush/Cheney-backed energy bill as an authoritarian scourge intended to literally keep Americans in the dark, but the transition to a smarter energy policy has actually progressed nicely and efficiently. The law has a variety of exceptions, though, for “for specialty lighting, including bulbs with unusual bases, others meant for special display purposes, and rough service bulbs.” Birnbaum described a “rough service” bulb as one that “can take a beating, one meant for industrial purposes — imagine a lightbulb on a subway car, built to survive the jostling and vibrations of the daily commute.” He said that they work like normal bulbs and, as Fox News noted, “consumers can buy them and screw them into any ordinary lamp socket.” Birnbaum applied for a permit to build the bulbs in 2010 and, after a tedious and bureaucratic process, he finally got approval to make his “Newcandescents” bulbs, which “began shipping in 2010 — made in America, at a plant outside of Indianapolis by around two dozen employees.” Birnbaum said that he received over $100,000 worth of orders after an appearance on the Rush Limbaugh show in 2012.